Boat Life Style-Premier Marine: Things You Need to Think About if You're Looking to Buy a New or Second Hand Boat! Things You Need to Think About if You're Looking to Buy a New or Second Hand Boat! Buying a boat can be a difficult decision to make. It's a great idea to do as much online research as possible and then visiting a Boat Show is a great way to see various models back to back! 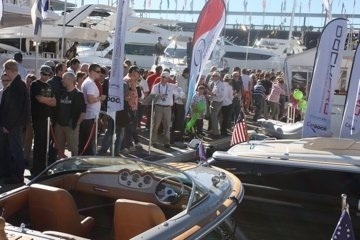 I had a customer who visited us at the Boat Show last year. He'd just purchased a brand new Glastron and he was so excited about his purchase, until, that is, he stumbled upon our Chris Craft. Immediately he knew, he'd chosen the wrong boat. He decided to purchase our new Chris Craft and sold his brand new boat, which hadn't even been delivered. As a result he did experience a financial loss in having to do this. He was happy with his decision, however and he loves sending me update photos and telling me just how much attention he gets when he is out cruising around Sydney Harbour. Boats can be like cars and you certainly get what you pay for. Don't be fooled by a 'steal' though, as if it seems too good to true, it probably is. You don't buy a 95 model Lancer expecting it to perform like a 2012 Limited Edition Bentley. The same can be said for boats and perhaps a little more so, considering the only thing your boat has to do is give you a pleasurable experience. With boating it's about the journey and never just about the destination, which is more of a reason to buy a good quality boat over a cheap one. If their answer is due to an upgrade, ask them if it is the same brand or another brand. If the owner is upgrading to the same brand, you can be confident that they've had a great experience with this boat and it's more likely to be a good option for you. If however, they're getting out of boating altogether or just this brand of boat, the chances of this boat not living up to their expectations are quite high and therefore, it might be the same for you. Ask to view the full service history of the boat and do know if the boat is about 5 years old, you're likely to be footing a bill for replacing the manifolds and risers etc. Most boaters in the know, tend to upgrade at the 5 year mark, due to the maintenance required and this is generally the point at which expensive re-builds can come into play. If the boat receives positive feedback, do make sure the areas where the owner goes boating is similar to where you will be boating. Most boats will perform well on flat water but do remember, if you're boating in choppy conditions, it's important to have a good hull design, just like that of a deep vee hull by Chris Craft or the patented Fast Trac Hull by Regal Boats. Make sure you get a marine survey carried out on any second hand boat. This is the most important thing to do as, although it's still not a guarantee on the quality of the boat, it will certainly give you an idea of anything that needs to be fixed, which can then be used as part of your pricing negotiations. How many people do you want to take out boating at any given time? You need to know what size boat will suit your every need. Whilst it's nice to share this luxury with your friends and family, ultimately, it should be all about you. Narrowing down the maximum amount of people you want on your boat is great so you can then work out the size you should be looking at. Do you want to trailer your boat or keep it on a mooring? It's obviously cheaper to buy a boat on a trailer but then you have to work out where you will store your boat and trailer AND of course, you need to remember the extra work involved each and every time you wish to take your boat out. If you decide to trailer your boat, you need to remember the restrictions in what size you can buy. If you decide to keep your boat in a berth or a mooring, there will be monthly payments involved and this varies due to the area you choose. Always try to choose an area that is close to where you live so as to keep it nice and simple. Obviously if you're keeping your boat in the water, you will have the expense of anti-fouling as well as ensuring the maintenance of your boat is upheld. The most important point is to look at is the latest technology to ensure the ongoing integrity of your boats, which has come a long way. To protect the overall condition of your engine/s, you should ideally start your boat fortnightly but no less than monthly! This will stop salt water drying onto the mental components where corrosion begins. In particular, the Ocean X Drives by Volvo are absolutely brilliant if you're planning on keeping your boat in the water. OCEAN X DRIVE The Ocean X Drive is a titanium-ceramic coating and new sensor technology that encases the leg of the Volvo engine as fitted in the factory. This is the latest technology that has been stringently tested and proven to stop corrosion from salt water and any surface damage that can be caused in daily use (for example hitting a rock causing a crack that would generally lead to ongoing corrosion but the ceramic coating will prevent this). This coating is up to 4 times more effective than a standard engine. The titanium ceramic coating is highly durable, flexible and covers the entire drive for maximum protection. The Drive sensor monitors the quality and level of the drive’s critical gear lubricant. The U Joint Bellows sensor alerts if water intrudes in the bellows area. - No corrosion - By replacing corrosive Salt-Water with Fresh Water, you will prevent corrosion damage. - No scale - Complete elimination of scale build up inside the water passages of the engine. The salts that exist in seawater, as well as "hard" fresh-water create scale that will restrict proper coolant flow and heat transfer. Of course, you need to remember you get warranty when you buy a new boat and generally the post sales service from a dealer will be a much needed asset over buying from a private seller who will offer you no service at all. Especially if you're new to boating, knowing there is someone you can call is great security for you. From someone who has been in love with boating for 10 years now, I can honestly say, boating is one of the most special and memorable experiences you can ever have and one I would definitely recommend to anyone who is toying with the idea. I cannot express how many times I've been thanked by my customers for literally changing their lives, which is testament to why you should all take a leap of faith and jump aboard what is set to enhance your lifestyle! does your company do marine surveys on boats? We certainly do have marine surveys carried out and we suggest that all our second hand boat buyers get one done also. Whilst a marine survey can't guarantee a good boat, it certainly helps as often things are picked up through this process that would otherwise be overlooked. If you want any more information do not hesitate to ask.